In this popular and comprehensive book, nutrition researcher and founder of the Weston A. Price Foundation Sally Fallon recalls the culinary customs of our ancestors and looks ahead to a future of robust good health for young and old. 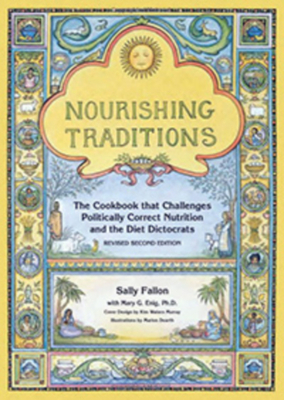 Nourishing Traditions offers modern families a fascinating guide to wise food choices and proper preparation techniques. Fallon unites the wisdom of the ancients with the latest independent and accurate scientific research. The revised and updated second edition contains over 700 delicious recipes that will please both exacting gourmets and busy parents -- plus a wealth of informative nutrition information, research summaries, and suggestions for how to serve various foods. More than just a cookbook, this is a treatise advocating for a renewed traditional approach to food and cooking. Sally Fallon (Washington D.C.) is president of the Weston A. Price Foundation, founder of A Campaign for Real Milk and a frequent contributor to alternative health publications. Mary Enig, PhD (Washington D.C.) is an expert of world renown in the field of lipid biochemistry and author of over 60 scientific papers.